Full, plump lips are often considered a sign of health and a marker of beauty. Some people find that their thin lips affect their confidence when it comes to their smile. New Orleans cosmetic surgeons, Dr. Kamran Khoobehi, Dr. Jules Walters, and Dr. Sophia Mai, perform lip augmentation to help patients achieve fuller, defined, and luscious lips. There are two ways to achieve this look, depending on your personal goals and aesthetic desires. These options include injectable fillers, such as Juvederm XC, or a fat transfer method using fat extracted from your body. While the results from both of these procedures look natural and beautiful, they are temporary. Patients who desire a more permanent approach to lip augmentation may consider dermal grafting, which uses the patient's own tissue as an implant, or an actual lip implant. Similar to other facial implants, lip implants come in different sizes and shapes to match the patient’s preferences. There are many options for lip augmentation and we are happy to discuss these during the initial consultation. AlloDerm: Another alternative to silicone is a tissue matrix that is fabricated using the dermis that is harvested and processed from cadavers. This is rendered acellular and so any rejection is very rare. As this is porous, natural tissues within the lips will be able to integrate through it further enhancing the natural appearance of the augmentation. It is inserted the same way a silicone implant is placed. Injectable Filler: This is a popular way to enhance the lips in a nonsurgical manner. Fillers are made from substances that are found naturally within the body such the hyaluronic acid or collagen based solutions. The result is realistic and looks and feels natural. Fillers produce beautiful results, however, they are considered short-term and reinjection is advised every 6 months. Dr. Khoobehi and his associates prefer to use Juvederm Ultra XC for the lips. The treatment process takes just one half hour. Results will be noticeable in as little as 2-3 days and will last 6-9 months. The surgical technique employed with lip augmentation depends on the type of material used. For implants, incisions will be made on the outer corner of the mouth and the implant is inserted through a tunnel that the plastic surgeon creates. The scars are concealed as the incisions are made along the natural lip line, and the sutures are so fine that once dissolved, they are unnoticeable. 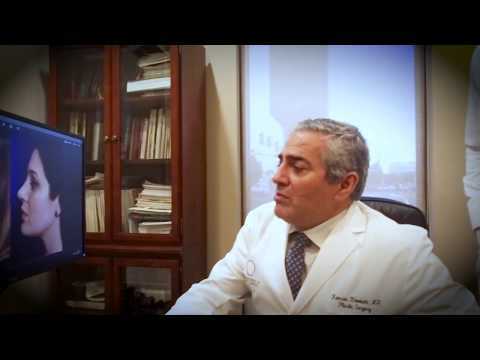 "Best Cosmetic Doctor Period - New Orleans, LA - I choose Dr Khoobehi after seeing the results of a face lift, lip augmentation, breast augmentation that a friends mother recieved! I have been to Dermatologists, Nurse Practitioners, OB GYN's,and Plastic Surgeons. Dr. Khoobehi is an artist with injectables! He is a master at his craft of surgery but also has the highest skill level to properly enhance any beauty with the non- surgical procedures. I now travel to get even Botox from him because he is THAT excellent!! I wish that I would have found him before I had my breast augmentation!! - - I choose Dr Khoobehi after seeing the results of a face lift, lip augmentation, breast augmentation that a friends mother recieved! I have been to Dermatologists, Nurse Practitioners, OB GYN's,and Plastic Surgeons. Dr. Khoobehi is an artist with injectables! He is a master at his craft of surgery but also has the highest skill level to properly enhance any beauty with the non- surgical procedures. I now travel to get even Botox from him because he is THAT excellent!! I wish that I would have found him before I had my breast augmentation!!" "59 Years Old, Wanted Neck Lift and Lip Augmentation - New Orleans, LA - Professional and perfectionist. Just what you want in a cosmetic procedure. - - Interviewed 3 doctors in New Orleans area and Dr, Khoobehi won hands down. He didn't over estimate my needs and could do it in his office with minimal anesthesia. He added perks that were unexpected and catered to my health before and after the procedure. Worth every dime! His staff and office were professional and modern." "This is my second time having lip augmentation with Dr. Weiss. I highly recommend that you do your research before choosing a doctor. I was not rushed at all. I talked to Dr. Weiss about exactly what I wanted and he was able to achieve exactly what I wanted. Recovery time varies by person, but I had a very quick recovery (2-4 days) for the swelling and faint bruises to fade. He stopped and asked if I liked the result before continuing with the rest of syringe to make sure that my lips did not look over-done. The results look very natural and I am very pleased with my lips' appearance! I wouldn't want to go anywhere else." "Very happy with my lips! - This is my second time having lip augmentation with Dr. Weiss. I explained to Dr. Weiss about exactly what I wanted and with his technique, the results exceeded my expectations. He stopped and asked if I liked the result before continuing with the rest of syringe to make sure that my lips did not look over-done. The results look very natural and I am very pleased with the appearance of my lips! Recovery time varies by person, but I had a very quick recovery (2-4 days) for the swelling and faint bruises to fade. I wouldn't want to go anywhere else and highly recommend anyone to go to him." Lip enhancement using an implant product will generally be performed under general anesthesia in an accredited surgical facility. It is considered outpatient and the entire process is usually concluded within an hour. Injectable fillers require no anesthesia, however, a local numbing medication is usually used. After the procedure, the lips will be swollen and there may be bruising present. This will go away after a few days and the patient will instantly see results of the treatment. It may take a few more weeks for the best results to show. Lip augmentation surgery fees can run up to $5,400. Injections average $600 (per syringe of filler). Although injectable fillers are less expensive than a single lip enhancement surgery, reinjection is needed to maintain the desired results. Patients may decide that a more permanent solution is worthwhile and can consider implants to save in the long run.